What Really Got You Going? 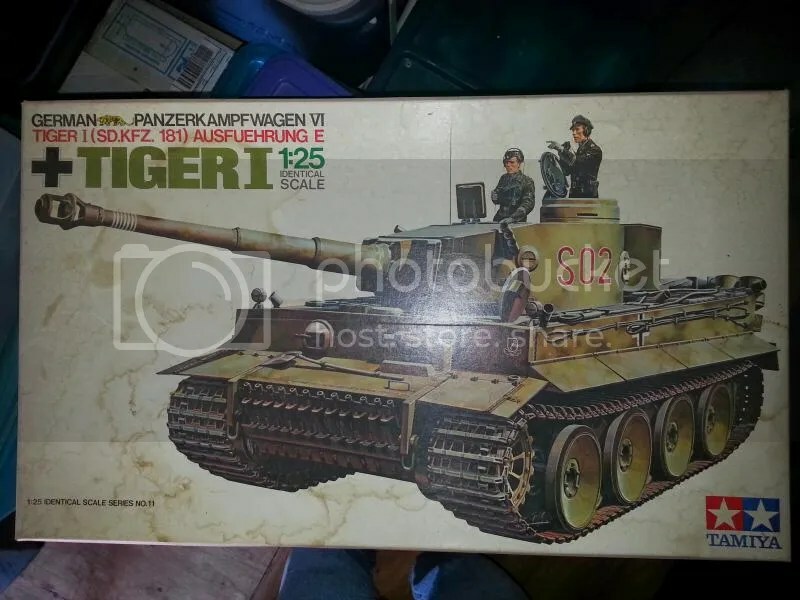 I don’t know how most modelers get started in this hobby, so I don’t have anything to compare to. I would imagine, that like me, that some got their start with a bit of influence from their father. My pop liked to build models when he was younger and by the time I came along, he was building and flying cable controlled airplanes. 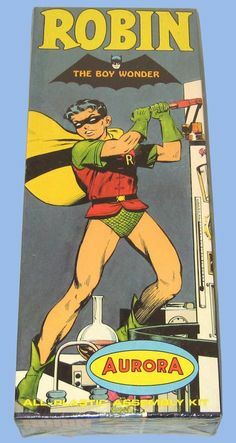 The first model pop bought for me was an Aurora Robin. I even remember where we got it… Hillcrest Drugs, a local “dime store,” as we used to call them. So, pop was my first influence. In ’76 a friend of mine introduced me to Monogram Armor. He had one of the Monogram Models Tips On How To Build Dioramas that Shepard Paine did. The one he had was the M4 Hedgehog. He let me have the tip sheet and I literally wore that thing out reading it over and over, while eyeballing the photos. That clinched it for me. 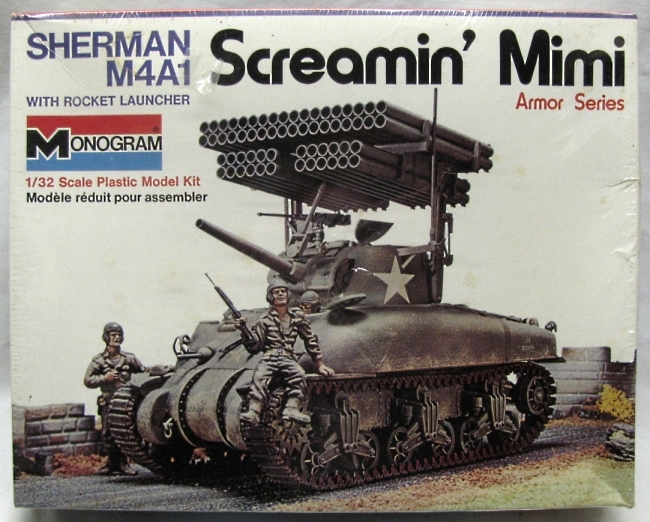 During a trip to the local Sprouse Reitz store, I discovered that they carried Monogram models, including the Screamin’ Mimi. My mom got the kit for me and I never looked back. This kit was the one that solidified my interest in armor, and for quite a few years, that is all I built. As a matter of fact, I have just recently ventured back into military aircraft. A couple of years ago, I was telling my son about the above kit and how much I enjoyed building it. A week or two later, a package arrived. It was this kit. A reissue from the late ’90s I think. He looked it up on Ebay and ordered it for me. When I cracked the box, a wave of nostalgia hit me. Surprisingly, this old mold was still pretty decent, and I built it straight from the box. It now sits in a place of prominence on my shelf, and graces the header of this very blog. Now that I think about it, it is kind of cool that things have come full circle. The kit that got me hooked in ’76, is the same kit that got me re-hooked now. Well, the holidays are over once again. As most can attest, it can be a busy time, full of busy things. Lots of family time for me and some work related stuff. But, this year I actually got to take some time off and hang out with the kids, do some running around, have some extra dates with my wife. An all around great time. But, alas, it comes to an end, and the end for me is tomorrow. Monday it is back to work… both real work (the kind that pays the bills) and the leisure type (like building models.) I have done a few things on my kits. Just put a clear coat on the Ta-152 so I can apply the decals, but more on that in another post. Since it is the first of the year, I have kind of plotted out a few projects I want to tackle this year. The first, is a ship. Normally, ships do absolutely zero for me. I really don’t care for the tiny scales related to ship models, for one. But this particular kit actually has some meaning. My grandpa shipped back to the states after his service as a rifleman in Europe on a ship called the Marine Raven. It was an army troop ship. 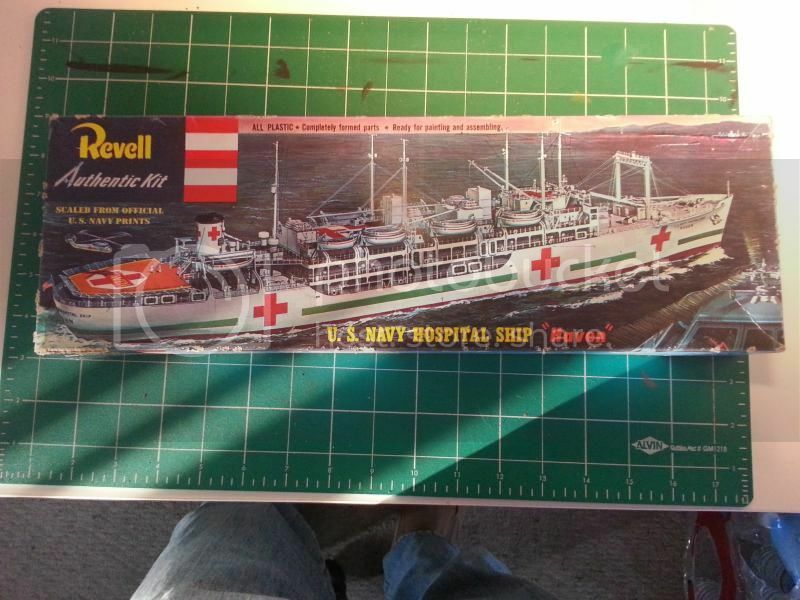 I was able to find some some info on the interwebs about the vessel, such as deck plans, how many were made, etc.However, no manufacturer has made a kit of the particular class of ship the Marine Raven was, but there was a kit made of a hospital ship based off of the same class. I will have to do some serious scratchbuilding (a first for me) but I have some good plans, so I should be able to swing it. This kit has been with me since the late ’80s. I got it (or, rather my bro got it for me) with the intention of doing a complete interior. It comes with a rudimentary interior already, and the top of the turret and the hull top comes off for viewing of the interior. I have found out in recent years that there are quite a few inaccuracies in this kit of the structural type, but that is ok. This project is going to be an exercise in more scratchbuilding, texturing armor plate, etc. Going to be quite the endeavor, but I would really like to sharpen my skills. So, stay tuned in the upcoming year for updates on these and other projects.